As many of you may now, just as of December, drivers and carriers are now required to have ELDs (electronic logging devices) in their trucks. Drivers will now have to use these devices to track their HOS (hours-of-service). The new ‘ELD mandate’ will have the greatest effect on smaller carriers, since larger organizations have been using ELDs for some time now. There is concern over whether the mandate will result in an increase in the cost of good across the board. This is because of the extra cost the owners and operators of the organizations will incur, which may be then be passed down to the consumer. With the mandate comes even more enforceable regulations. For example, the length of time you can drive without taking a break is now predetermined and tracked. Additionally, there are other steps drivers must take. The intention of the mandate was to make a safer work environment for drivers, however there is also concern over whether it will cause drivers to feel rushed in order to ‘beat the clock’. 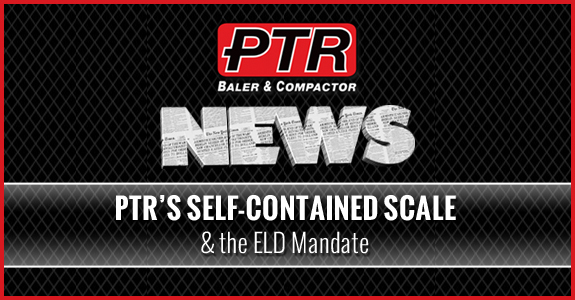 More information about how the ELD mandate will effect drivers, carriers, manufacturers, and more can be found here. Now more than ever, productivity in all other facets of the organization will become even more important. Cost-saving equipment like our revolutionary Self-Contained Scale can help mitigate the extra expenses caused by the ELD mandate. This innovative scale is the solution to eliminating overweight containers, allowing your organization to optimize pickups for required weights and saving you big on tipping fees. Our weight monitoring system is available for both vertical balers and compactors. Click here to learn more. Contact PTR to find out more about how we can help increase efficiency in the waste operations your company and don’t forget to sign up for our newsletter to receive exclusive company updates, new product launches and more. PTR compactors are the highest quality, most durable and reliable on the market. We have a variety of models of both self-contained and stationery compactors. 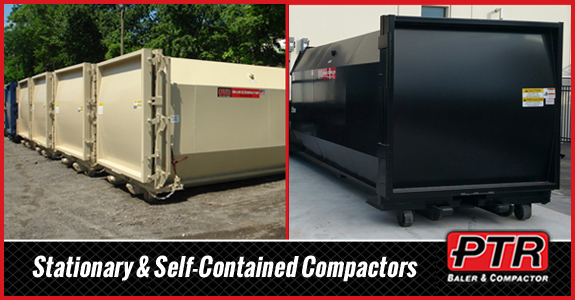 The key difference between the two types of compactors is the type of waste they process. If your company deals with a fair amount of wet waste, such as a restaurant or hospital, a self-contained unit will best suit your needs, whereas stationary compactors are appropriate for dry waste. Our PTR Self-Contained ‘Pak-Tite’ series of waste compactors are the ideal equipment to handle your wet-waste requirements. Every unit is made with heavy duty structural steel and equipped with our ‘Clean Flush Sump System allows liquid to flow out into the 750 gallon sump reservoir. From there, it goes directly to your sewer system. You’ll see an considerable savings in hauling fees. The innovative design ensures better compaction, more efficient water runoff and eliminates leakage. Every unit is thoroughly water tested and completes a factory inspection. Rest assured, each unit is also 100% U.L approved and manufactured in the United States by certified welders of the American Welding Society. • Retail Supercenters who frequently process wet waste. Additional options are also available. These include PTR BioLoc for added security and safety, side and rear chutes, doghouse or total enclosure, odor control Sonazaire®, ‘One Plus®’ fullness monitoring system, and a hydraulic tailgate. We offer 42″ and 52″ feed heights ranging in container volume from 12 to 35 cubic yards. For more on our most popular models, click here. Our line of stationary compactors efficiently and safely compress dry waste. You’ll benefit from a significant reduction in overall cost associated with waste removal. The reduction in waste also means less contribution to land-fills, improving your company’s carbon footprint. This equipment is the answer you’ve been looking for to get your company to implement sustainability policies. There are a number of models to choose from. No matter how big or small your business, we have a model that will work for you. For more information on available models, click here. Heavy duty models and apartment compactors are also available. Contact us here for more information. We also offer additional features for stationary compactors including our PTR BioLoc, side and rear chutes, doghouse or total enclosure, odor control Sonazaire®, One Plus® fullness monitoring system and an oil heater. Have questions or still not sure of which is best for you? Contact us here. Our customer service representatives will be happy to answer any of your questions or concerns. The upcoming holiday season means several different things for the majority of businesses. The increase in production and sales will result in a significant increase in waste streams. It also means a surge in equipment usage. Consequently, those businesses with older machines will most likely need servicing or repairs of some kind. If your current equipment is very old, you may want to consider a full refurbishing. This is not the time to have a halt in productivity, so you’ll want to ensure your equipment is running efficiently as possible. Schedule a maintenance or service with PTR by contacting us here. The earlier you schedule, the better. The last thing you should be worrying about during this busy time is your waste equipment functioning correctly. Did you know PTR will provide service on any manufacturers waste equipment, not only our own product? Our expert service technicians are highly skilled at working with all waste equipment, regardless of manufacturer. They are ready to insure that all of our customers are up and running through the holiday season. We offer service on Vertical Balers and Compactors nationwide, from coast to coast. Additionally, PTR is able to service dock levelers, floor scrubbers, door seals and mobility products regionally. Your waste equipment is some of the most important to your organization’s productivity. Trust only technicians who have hands-on experience and factory certified training. That’s what we offer with every single baler and compactor purchase you make with PTR. Service requests are handled promptly and professionally. We pride ourselves on the fact that our technicians arrive on-time, completing the service call the first time, nearly every time. When you purchase equipment from PTR Baler & Compactor Company, you’ll be assigned a courteous personal customer service representative. Whenever you have a question or concern, they are available to you 24/7 and will be able to connect you with a certified technician in your geographic area. We offer engineering support, mechanical support and technical support. Our expert technicians are highly trained professionals with years of experience in the field. We take care of all your equipment repairs promptly, as well. Proper maintenance and service is key to extending the life of your equipment. Our cost-effective preventative maintenance plans are a smart option, resulting in a reduction in overall cost of ownership, increased employee productivity and improved safety. Maintenance programs are customizable to best meet your individual needs and work within your budget. Learn more by clicking here. 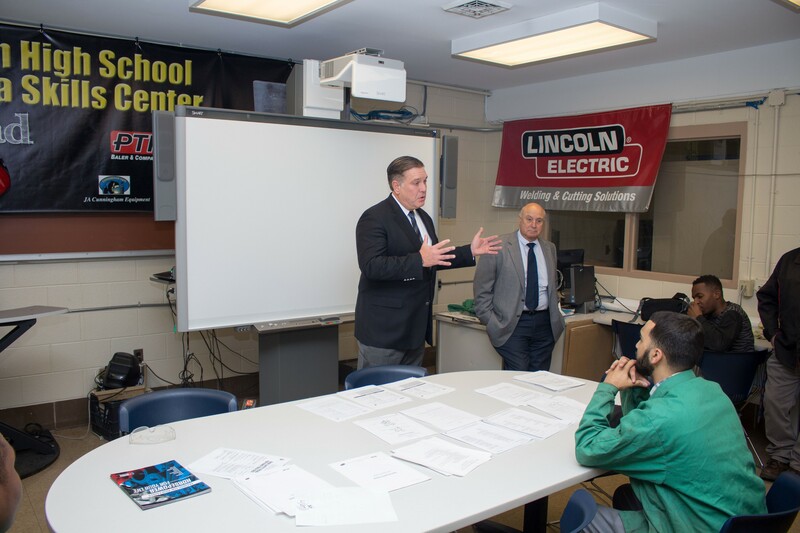 President & CEO Mike Savage & Vice President of Manufacturing Garry Fudala visit Edison High School and donate supplies on Giving Tuesday. 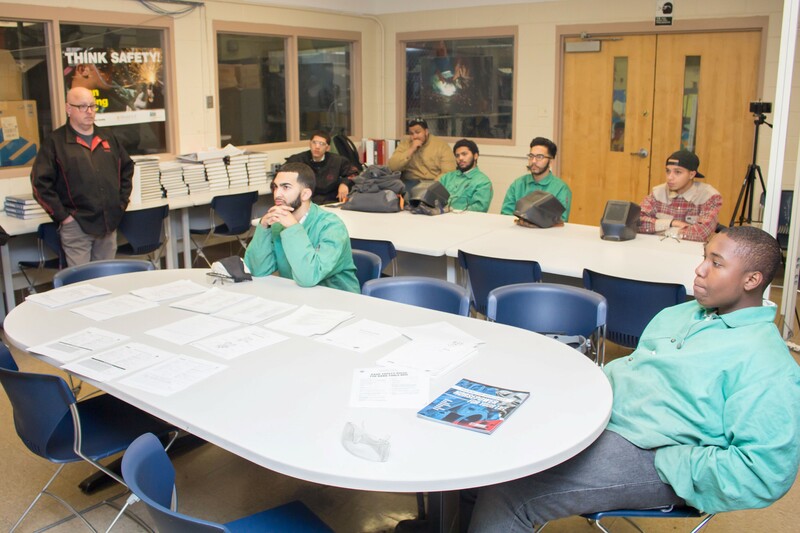 Today, PTR President & CEO Mike Savage and Vice President of Manufacturing Garry Fudala, made a special visit to Edison High School in Philadelphia. 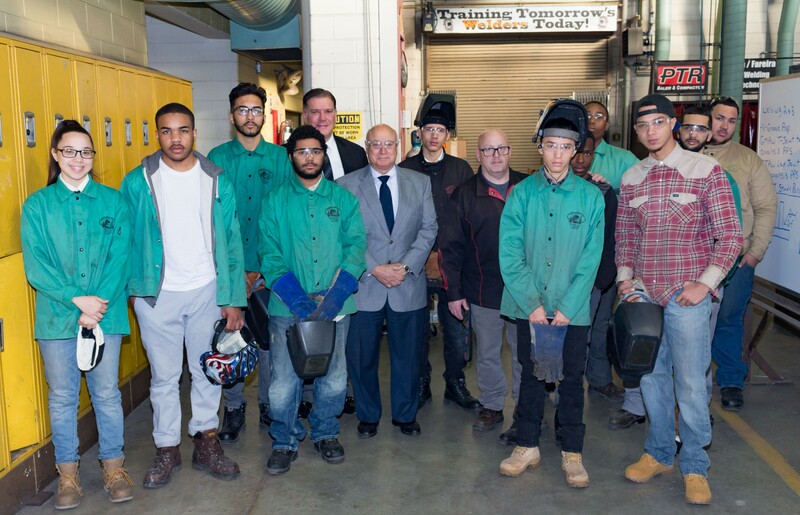 ‘Giving Tuesday’ was the perfect opportunity to donate welding supplies to the Philadelphia Technical School’s vocational training class. 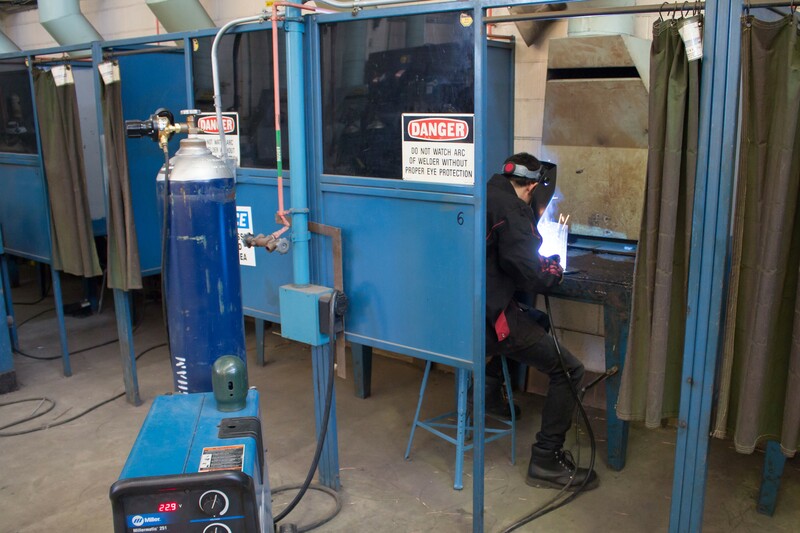 Edison High School teaches students invaluable vocational trades, such as hydraulics and welding. These are the skills necessary to create tomorrow’s workforce- today. What better day than ‘Giving Tuesday’, to make a contribution towards the future of our country’s prosperity and the success of the next generation? PTR Baler & Compactor Company is extremely proud to be part of the local community. We strive to continually find more ways to give back to those who helped make us as successful as we are today. ‘Giving Tuesday’ was established back in 2012. It’s celebrated across the world as a day to give back and make a difference in our communities. No donation or good deed is too small or insignificant. The word is spread through the power of social media using the hashtag #GivingTuesday. After the mass consumerism that occurs on Black Friday and Cyber Monday, ‘Giving Tuesday’ is a great way to spark the true spirit of the holiday season. It’s the perfect time to support your favorite charities, donate to local food banks, shelters and schools, or find other ways to get involved and lend a hand. Looking for ways to give back in the Philadelphia area? Mayor Jim Kenney encourages people to donate directly to Philadelphia school through a new site, ‘Philly FUNDamentals’. Donate and learn more here. Learn more about the global movement at www.givingtuesday.org. Curious to know what we’ve been up to? 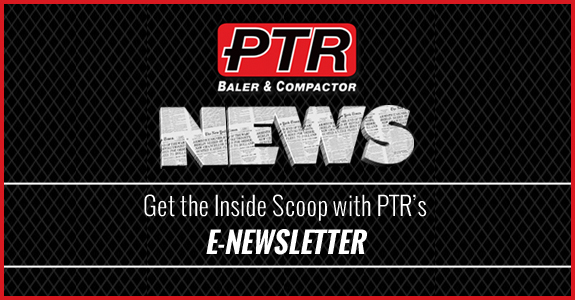 Our e-newsletter is your inside scoop to what’s going on at PTR Baler & Compactor Company. You’ll get insider knowledge of innovations, new technology, product launches and much more. It’s also a behind the scenes peek at our community involvement and other endeavors we’re passionate about. We’re on the verge of a huge milestone here at PTR. Soon, we’ll celebrate 50 years of making balers. During the last 5 decades, we’ve strived to lead the industry in quality, innovation and customer service. Our newsletter gives you an in depth look at what’s to come in 2018, like our incredible 1 ton baler. Sign up to receive the e-newsletter to be sure not to miss these important product updates. Informative infographics and industry statistics will be included to help you get a better understanding of how our equipment works and improves your organization’s waste operations and management overall. You’ll also learn more about what makes a PTR product a cut above the rest. No one else in the industry serves the amount of retail markets as we do- currently, PTR serves 16 out of 20 major retailers in the country. In our newsletter, you’ll get a first hand account of the latest technology we’ve been developing, like our Compactor Weight System. What this technology means to you is more efficient and accurate waste tracking. This in turn saves you money and time. The new weight system also improves safety in a number of different ways. Helping our customers improve employee productivity and safety are two major priorities for PTR. The new Compactor Weight System is another way we’ll achieve those goals. Sign up for our newsletter to find out how. Hurricane Maria made direct landfall on Puerto Rico on September 20th, bringing down feet of torrential rain. It devastated the island and the 3.4 million US citizens who live there. 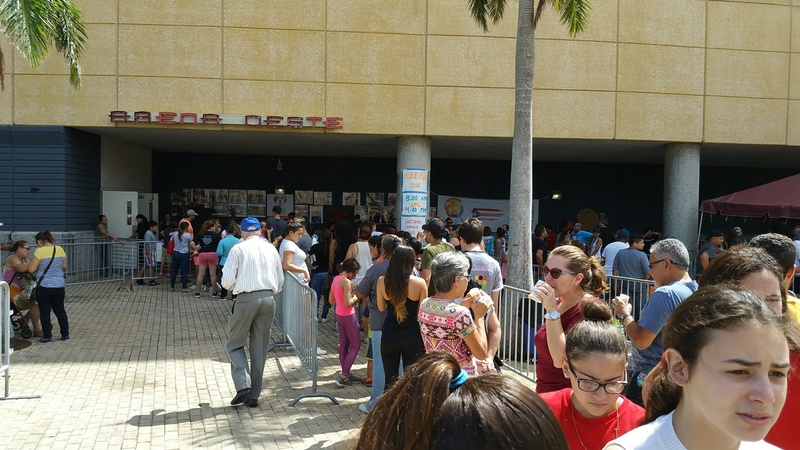 When Maria hit, 60,000 people were already without power following Hurricane Irma, exacerbating the dire conditions that much more. Maria was the strongest storm to hit Puerto Rico in 80 years. Now, nearly a month later, much of the island is still without electricity. Clean drinking water and food is scarce. Cell service is down, so many people in the states have not been able to speak to their family and friends on the island for weeks. 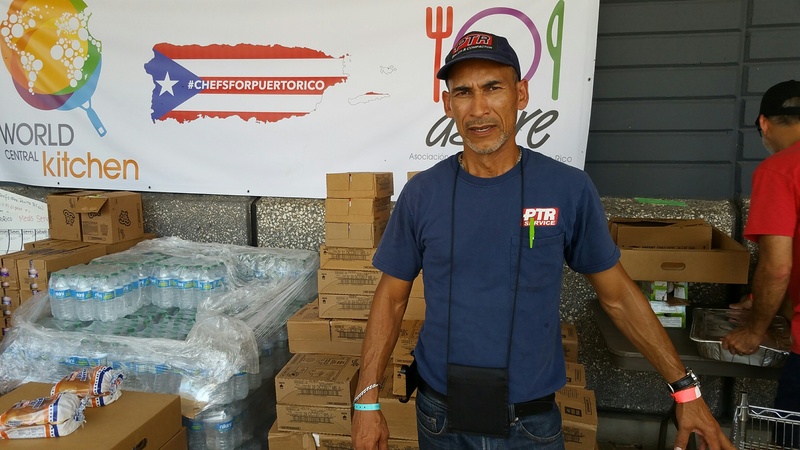 PTR representatives, Carlos Gonzalez and Enrique Diaz, have been delivering food and water to the rural areas of Puerto Rico. The food is being prepared and distributed from a local arena. The duo have teamed up with other companies in the area to help with relief efforts as well. Currently, there are about 20,000 people in shelters, and even more are living in the rural areas without any shelter at all. 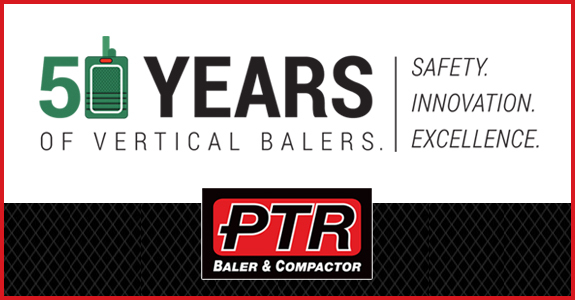 PTR Baler & Company is proud to have people like Carlos Gonzalez and Enrique Diaz on our team. We thank them tremendously for all of their efforts. If you are interested in learning ways you can help with Puerto Rico relief, visit one of the sites listed below. 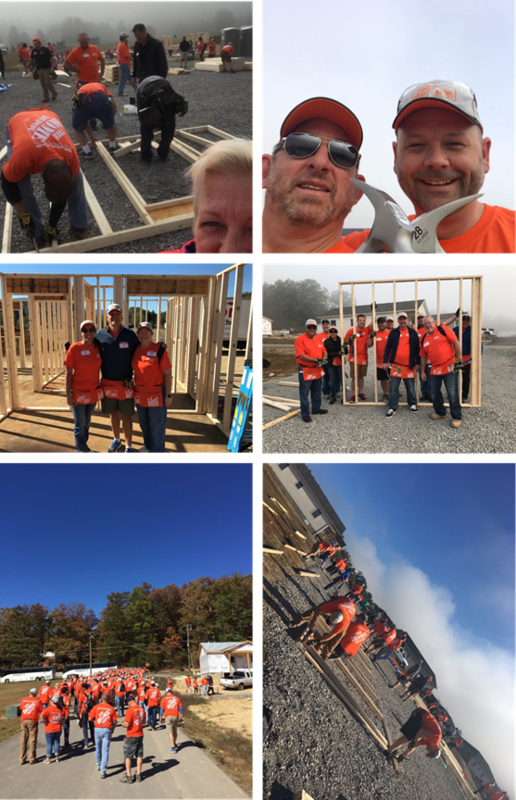 Last week, PTR’s CEO Mike Savage joined forces with The Home Depot Foundation in West Virginia for their ‘Building Services and Store Operations Foundation’ fundraising event. This successful endeavor raised an incredible $3.8 million for the foundation. The Home Depot Foundation works to improve the lives of our country’s veterans and their families, as well as to provide support and aid to cities hit by natural disasters. The foundation’s ‘Celebration of Service’ season takes place annually from September 7th through Veteran’s Day. Helping American communities, and the citizens who have sacrificed so much to protect us, is something PTR as a company is extremely passionate about. PTR’s CEO, Mike Savage, personally visited Hope Village in West Virginia. With the help of many of volunteers, they built the framing for new homes and began the revitalization of Mylan Park, the neighborhood park. In a matter of days, the team was able to nearly complete these houses. In 2016, a devastating flash flood hit the state of West Virginia. Torrential rains resulted in horrific damage and destroyed over 1,200 homes. Now, residents of these newly built homes will be able to move in and start anew. 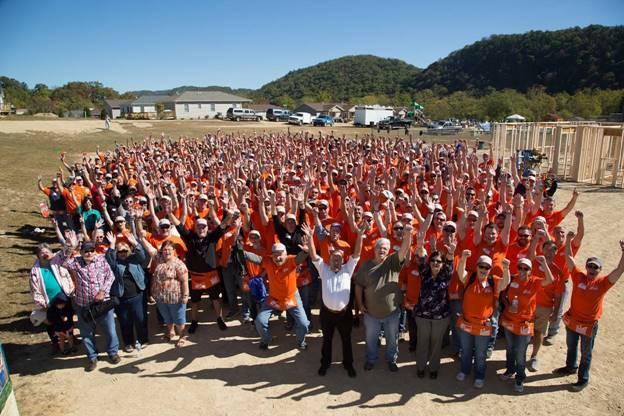 The Home Depot Foundation is a organization consisting of 400,000 associate volunteers. It was created to help our honored veterans, and those affected by flooding, hurricanes and other natural disasters. 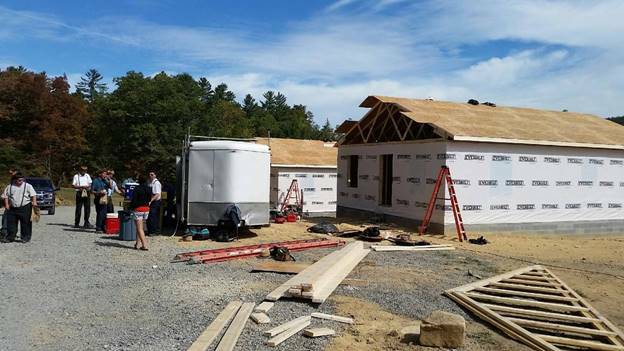 Volunteers build homes, install ramps or do other household or facility improvements. Over 33,000 U.S. military veteran homes and facilities has been improved. • More than $198 million has been given to veteran-related causes. • 2,000 cities across the country have been improved. The foundation has also currently increased their disaster relief commitment for Hurricane Maria from $2 million to $3 million. To learn more about The Home Depot Foundation and to find out how you can help, click here. 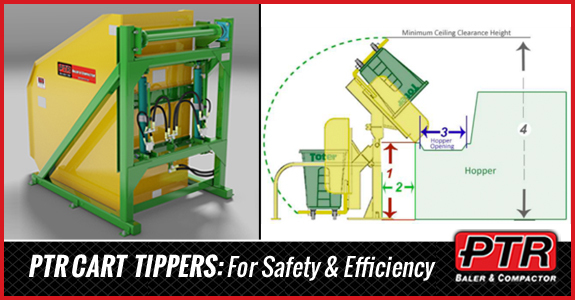 PTR Baler & Compactor Company Cart tippers are a smart, logical addition to your waste equipment. They significantly reduce the time it takes to transfer waste from your collection cart to your waste compactor, dumpster or collection container. A variety of models are available to suit every market’s varying needs. Whether you’ll be transporting small or large loads, PTR Cart Dumpers will prove to be a valuable asset to your business. For example, the PTR Economy 3069 Series MT is designed to lift a max load of 400 lb., while our Hydraulic Cart Tipper is rated for 4,000 lb. max load. See many of our cart dump systems by clicking here. Cart dumpers or tippers increase employee safety. Employees who are primarily responsible for lifting waste are inevitably at risk for injury. Consider these surprising statistics from a recent study by the U.S. Bureau of Labor Statistics. “In the US, back disorders account for over 24% of all occupational injuries and illnesses involving days away from work.” Additionally, “US workers who suffered ergonomic injuries required an average of 12 days to recuperate before returning to work.” (U.S. Bureau of Labor Statistics) You can help avoid work related back injuries by utilizing a PTR Cart Dumper. If employee safety is a top priority for your company, investing in a PTR Cart Dumper or Tipper is essential. Not to mention, back strain or more serious back injuries are a drain on money, time and productivity. Like all PTR Baler & Compactor equipment, our cart tippers and commercial lifters help keep debris and waste off of critical floorspace. Keeping floorspace clear not only helps keep up the appearance of your facility, but it also makes a safer workspace for employees. Plenty of other industries would find these commercial lifters extremely useful and beneficial to their employees. All models are very simple to install, and our technicians will show you and your staff how to properly use PTR equipment. A PTR cart tipper is the smart, economical choice. By preventing injuries, you’ll be preventing bottlenecks in your operation. This equipment helps protect employees as well as the business itself. Want to learn more? Our customer service representatives are available to answer any of your questions. Click here to contact us today. “Nonfatal Occupational Injuries and Illnesses Requiring Days Away From Work, 2015.” U.S. Bureau of Labor Statistics, U.S. Bureau of Labor Statistics, 10 Nov. 2016, www.bls.gov/news.release/osh2.nr0.htm. Part of PTR’s mission statement is the guarantee that we are committed to ‘providing our customers the most effective waste and recycling solutions throughout the service life cycle of the products we deliver’. We take this promise to our customers seriously. When we say we’ll be by your side after the sale, we mean it. We at PTR know in order to earn customer loyalty, you have to go the extra mile. In the last couple of weeks, hurricanes Harvey and Irma have caused catastrophic levels of flooding in Texas and Florida. Homes and businesses across both states are left to deal with the massive damage left in their wake. 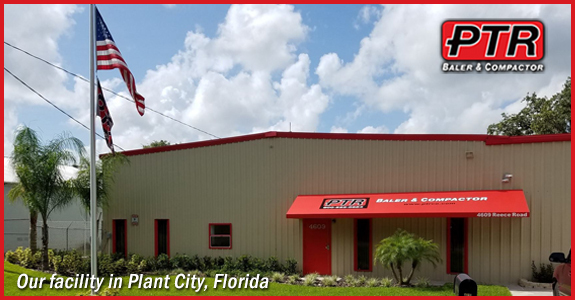 PTR’s facility in Plant City, Florida, has recently celebrated it’s first anniversary. We understand how difficult it is when unexpected, unpreventable events happen. It’s our priority to do our part to get your business back up and running quickly and most importantly, safely. 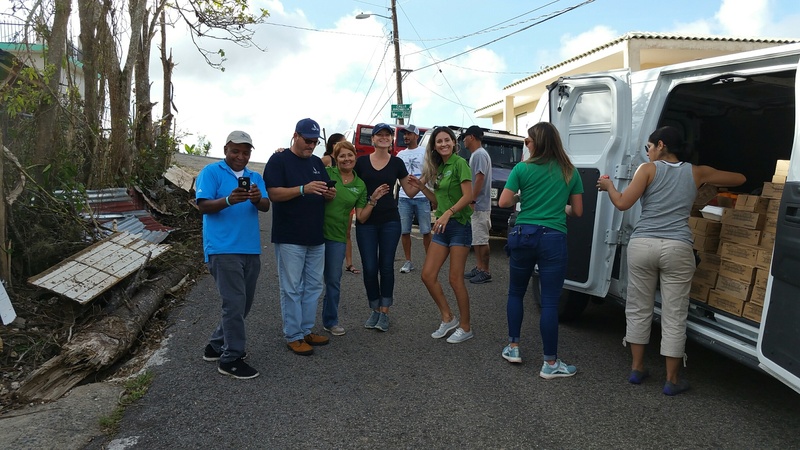 We’ll make every effort to aid in the process of our customer’s in the disaster struck areas getting back on their feet, and getting business back on track. 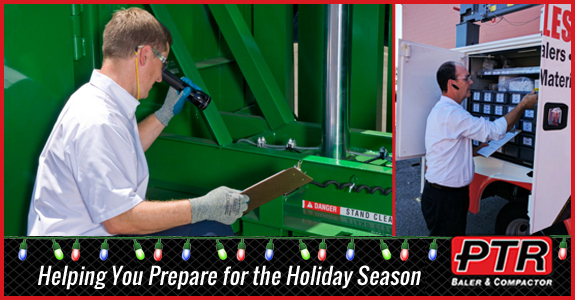 It’s especially during times like these that PTR Baler & Compactor strives to provide the best customer service imaginable. We know how important it is to get operations flowing again quickly. Rest assured we will provide the speediest response time possible, and do all we can to help our customers recover. After a very damaging situation such as flooding, it’s imperative to ensure your PTR Vertical Hydraulic Baler or Compactor is functioning properly before using it again. The safety of our customers, their employees and our technicians is of the upmost importance to us. PTR Customer Service is available 24/7 to assist in your recovery. Service requests from the areas affected by Hurricane Harvey and Irma will be treated as a priority. We urge all businesses with baler and compactors to contact us upon returning to your facility. Your unit will require a safety inspection verifying that your equipment is operating safely. Technical assistance is available by calling 1-800-523-1155 or click here.